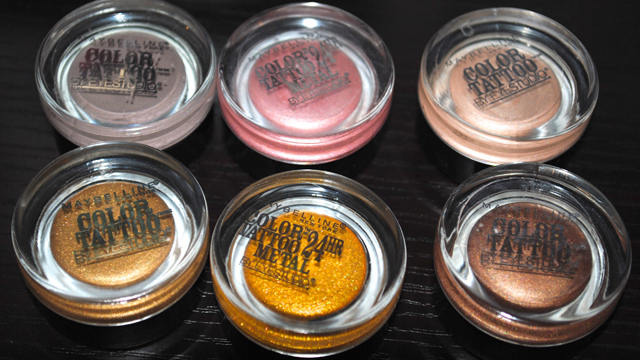 I really really love the Maybelline Color Tattoo cream eyeshadows. I love their color payoff and how simple they are to use. I currently have six. As I don't tend to go too crazy with makeup in general, I have stuck to buying the more wearable shades I've seen. Last week, knowing that I had a couple of holiday parties to attend, I made an exception and bought Gold Rush, a shade from the new Metal Collection. Gold Rush is a brighter, yellower, more punched-up version of Bold Gold from the permanent collection. Of the Color Tattoos I have, almost all of them are incredibly easy to apply (I apply with my finger), with the exception of Tough as Taupe, which is much drier and harder to work with. It is the only matte color I have, so of course I still like it despite all that. Tough as Taupe is great as a base for a smokey eye. To sum it up, I think the Color Tattoo is very unique product (especially for the drugstore) and definitely worth the money. 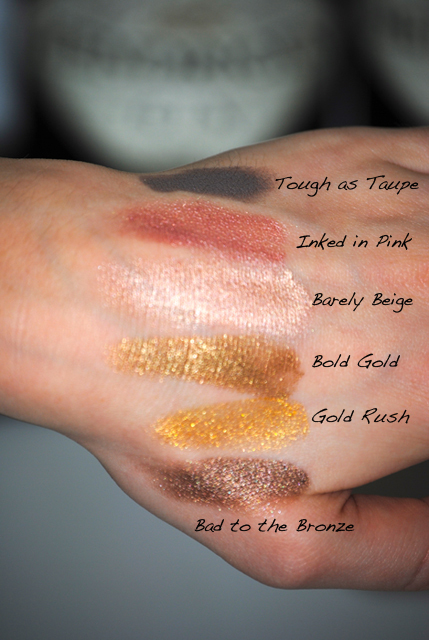 My favorites: Inked in Pink, Barely Beige, and Bad to the Bronze as these are the most versatile for me. I can wear them at work on their own or use them as a base shade and really jazz up a look. *Inked in Pink and Gold Rush are part of the brand-new Metal Collection. 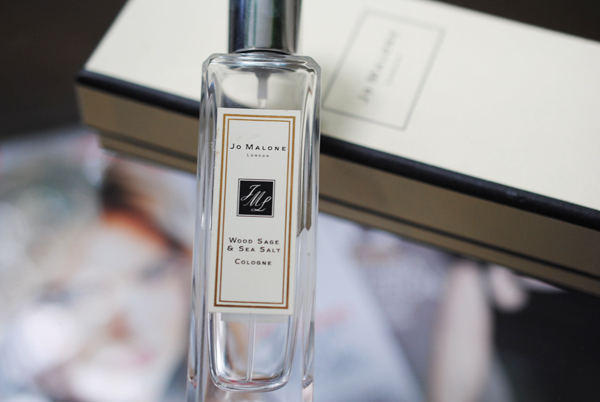 *Barely Beige was a limited edition fall 2012 color, an available dupe is the Metal Collection's Barely Branded.